I didn't see anything posted about this, but figured someone on here might want to know. 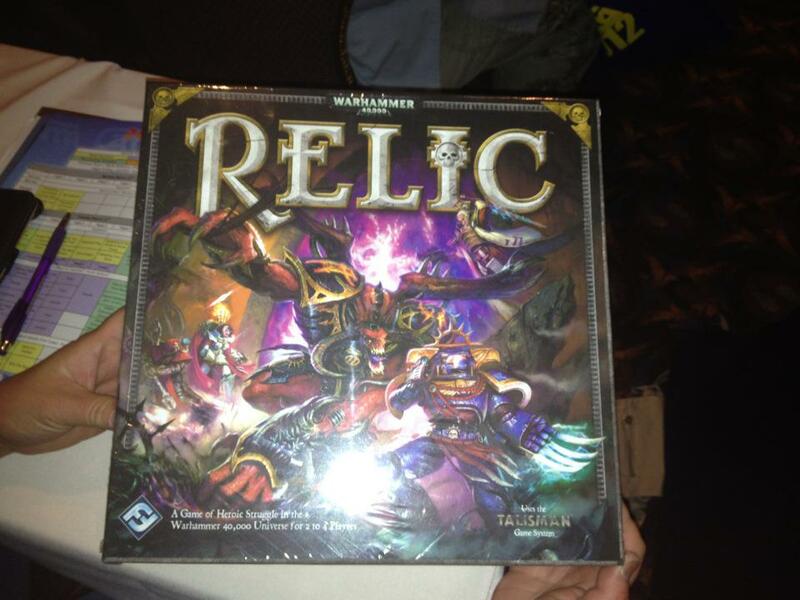 Announced yesterday at GAMA is Relic, a 40k version of the old game Talisman. PM me if you want me to draw anything related to Warhmmer 40k. I will put it in my gallery for all to see. I wonder if it will be compatible a la the the old Talisman Timescape expansion? Have you thought about the Axis of Evil pension scheme? Initial impression: Relic? Well that doesn't sound very 40K-y. Oh, and a Marine on the front cover. What Russian company is ripping off 40K this ti... FFG? It's an FFG game? Really??? We must see more shots of this. A borefest with a good theme is still a borefest. Still, it looks cool and might be fun if I can persuade my gaming group to give Talisman another go. The first (and last) experience was so negative, I doubt it. A three hour game with few decisions and no end in sight is not fun. H.B.M.C. wrote: Initial impression: Relic? Well that doesn't sound very 40K-y. Sounds interesting,anyone got a product link. Doesn't appear to be on the FFG site yet. Anyone know something about the talisman system? Good? Bad? Pyriel- wrote: Anyone know something about the talisman system? Good? Bad? Talisman is decent but a lot of what it has going for it is the appeal of nostalgia. I played it when I was much younger (15-20 years ago) and then got a copy recently to play with my gaming group. They, having not played the original, were much less convinced of its 'charm'. The picture in the first post is broken for me. Its a boardgame where everyone travels around board killing stuff, in order to build up stats, and get magic items so you can go into the center and fight a dragon for the crown to win. If a player lands on a square with another player, theres an option to attack the player and take stuff. heh. So, it can get pretty cutthroat. The old version used to end when someone won the crown. In the new version, when a player wins the crown he starts attacking all the other players. So, they still can get to middle, inflict some beat down and take crown. There's also expansions on the basic game which adds maps to corners of basic map. Its monopoly long (could be 3+ hrs), not a whole lot of stratagy, but I give it thumbs up. Its a fun game to sit around and play with a few . poipo32 wrote: The picture in the first post is broken for me. I changed the host on the image, it may work for you now. If not, I dunno. Surprised the WH40K logo is so small. That’s not all that unusual for the FFG games. This could be interesting, but if it is simply Talisman in a 40K skin then this would be somewhat disappointing. I have the BI and FFG versions of Talisman so the same game with essentially the same board but 40k'd and different player pieces holds no interest. Smack talk, victory dances, and coming up with ridiculous personal goals that have nothing to do with the win condition should be encouraged. Movies playing and other distractions are perfectly fine. You only really have one choice: left or right. Dont take forever to make it. Dont be passive or defensive either. Angry or sullen is right out. There's too little player input in the Talisman system so I'm not very interested. The Tick: Everybody was a baby once, Arthur. Oh, sure, maybe not today, or even yesterday. But once. Babies, chum: tiny, dimpled, fleshy mirrors of our us-ness, that we parents hurl into the future, like leathery footballs of hope. And you've got to get a good spiral on that baby, or evil will make an interception. Can I be the daemon prince? Talisman was a pretty fun game back in the day. I have many fond memories of it! I've been tempted to buy the updated version of it. I think the appeal of it was that it had everything gw all mixed up. Wood elves and space marines. Dunno if I'd want a 40k only version of it, but who knows it could be a blast. You know how to play it too! So, so fun and I hope that the 40k one is too. Picture works for me now! Agreed. They need to simply include these rules in the official rulebook. I literally "Hnnng-" 'd out loud. I have played some epic games of Talisman with friends. As long as the price on this is right, like not Dread Fleet sized, I'll be picking it up. azreal13 wrote: Dude, each to their own and all that, but frankly, if Dakka's interplanetary flame cannon of death goes off point blank in your nads you've nobody to blame but yourself!